So I share my knowledge today with everyone. Rule number 1 when entering round-abouts. Always give way to vehicles on the right side. 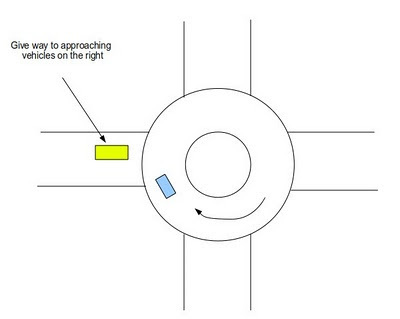 I get inadequately trained drivers expecting vehicles within the round-abouts to give way to their vehicle to enter. The worst scenerio I ever encountered was a vehicle stopping within the round-about giving way to another vehicle wanting to enter the round-about. The reason for having round-about is so that the traffic flow within the round-abouts does not stop. Drivers are expected to know and use the window of opportunity to enter the round-about rather than having timed traffic lights to stop vehicles even when there are no traffic within junctions. 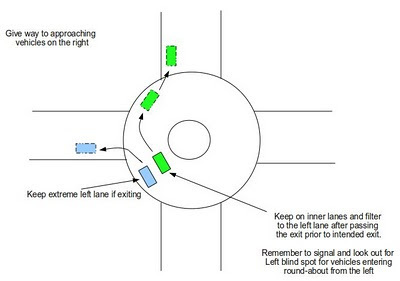 Here are 2 diagrams I created to help new drivers learn how to navigate and negotiate a round-about for the sake of better traffic flow and safety of other motorists.